If you are a lender, whether you work with mortgages or banking, you may be interested in Loan Software. Loan Software is used for storing loan data and documents during the loan application process. With Loan Software, you can easily collect, store and share loan documentation. Plus, Loan Software lets you do so without wasting paper or losing important physical copies of documents. So, you may be wondering how Loan Software works? Well, with web-based and hosted Loan Software providers, you don’t have to purchase any hardware at all. Not only does this save you money, but it makes the loan application process easier for lenders and borrowers alike. To take advantage of Loan Software services, all you have to do is log in from the Loan Software provider’s website, and you will have instant access to all of your borrower’s loan data and documents. With Loan Software, you can choose the formats you save your documents in. Pick the method that is best for your specific needs with ease. You will be able to upload files to loan quick pricing engines, consumer websites, and so much more with ease, all thanks to Loan Software. You will also be able to store loan data without worrying about file cabinets or folders. Instead, store this data online so you can organize and find it quickly and simply. Even signing documents is a breeze with Loan Software. E-Signed helps your borrowers fill out documents from anywhere in the world, all with superior security and privacy. 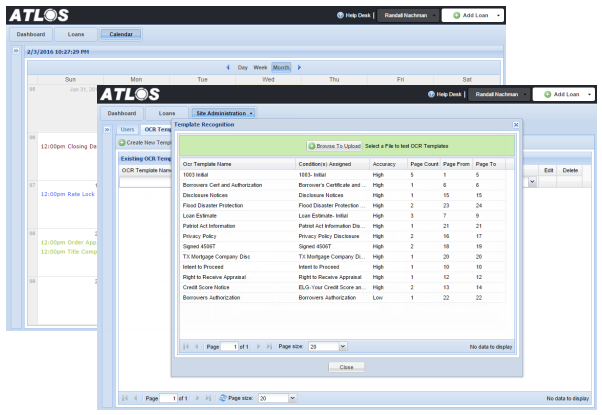 So, if you are a loan provider seeking the best Loan Origination Software for your needs, consider ATLOS. Our paperless Loan Software will help you efficiently handle documents and can completely eliminate the need for paper. If you’re interested in learning more about our paperless Loan Software, request a free demo today on our website. You can also reach out to us by phone at 225-308-8843 for more details. This entry was posted in ATLOS Latest News, Document Imaging, Paperless Lending Solutions, Paperless Loans, Paperless Mortgage Software, Web Based Mortgage Software. Bookmark the permalink.